Vislink's new updated systems will be on display at booth 1540 at the upcoming Milipol Asia-Pacific 2019 in Singapore. Milipol Asia-Pacific is the region’s leading international event for homeland security, and Vislink's products are widely used by U.S. Navy, Special Forces and SWAT teams around the world. Vislink will be showcasing its range of downlink, satellite and wireless camera solutions including the following: the updated Airborne Video Downlink System (AVDS), which now comprises the new TSM-2020 Transport Management System; the Advent MSAT tri-band satellite terminal; and a wide variety of Vislink wireless transmitters, such as its IMTDragonfly, ETP-4, ETV-5 and ETM-6. Vislink’s AVDS is an integrated suite of downlink transmitters, receivers and antennas that creates a comprehensive aerial-based video transmission solution. It is designed to improve situational awareness through real-time HD video surveillance captured from drones, helicopters and other aircraft for display at command centers, mobile units and on video management systems. 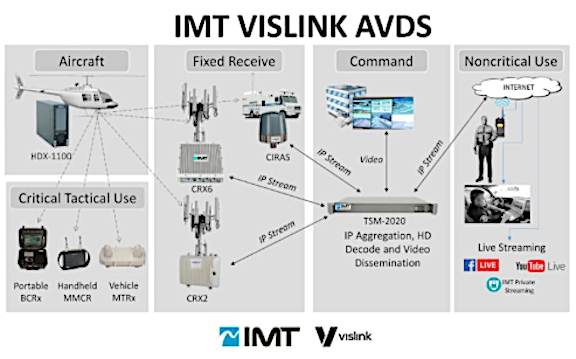 Vislink’s AVDS, which now features the company’s TSM-2020, is used to collect, aggregate and distribute video captured from one or many receive site applications. It controls and accepts video streams fromVislink’s family of IP diversity receivers for viewing by commanders, staff and other key stakeholders. The addition of TSM-2020 as part of the overall AVDS system extends critical situational video to an unlimited number of observers who can view the video over any network connection, including wired ethernet, WiFi, IP satellite and IP cellular. Vislink’s AVDS system is also comprised of the HDX-1100 microwave transmitter and Mini MobilCMDR handheld receiver/monitor, as well as the CIRAS-x6, CRx6 and CRx2 COFDM receivers. John Payne, president and COO of Vislink Technologies said that as a trusted and valued partner to the armed forces and law enforcement agencies worldwide, Vislink is excited to be showcasing a variety of products designed to meet the needs of high-end video services at Milipol Asia-Pacific 2019. They look forward to showing those in attendance how the compact form-factor, reliability and easy deployment of their solutions make them ideal for demanding and challenging surveillance video environments. In addition to the AVDS, Vislink will also be showcasing the Advent MSAT, a highly portable, lightweight, tri-band satellite terminal that can be set up anywhere to provide secure and non-secure data and video transmission in as little as five minutes. It supports X-, Ku- and Ka-band configurations, ensuring worldwide coverage. Available with a 65-, 90- or 120-cm reflector, the system is designed for rapid deployment in hostile environments and can be used with mains power or battery operation. Vislink will also present a wide array of wireless camera transmitters at Milipol Asia-Pacific 2019. These include the HDMI-compatible IMTDragonfly superior miniature wireless camera transmitter, designed to capture real-time video from UAV/UGV/Body Cams/Concealments for display on fixed or mobile receive applications. When pairing the IMTDragonfly with the MOHOC® tactically-designed military helmet camera, it provides ultra-low latency and broadcast quality live video transmission over RF in the most extreme environments. MOHOC cameras are already deployed with the U.S. Navy, Special Forces and SWAT teams around the world. The Vislink ETP-4 3G/4G body-worn video transmitter delivers high-end video transmission and ease-of-use. With a built-in confidence monitor, users can quickly and easily verify that their content is being transmitted. Additionally, the 5X (extendable to 9X) 3G/4G up-link interface ensures maximum data speeds, delivering unrivaled video quality from any remote location. The small form-factor of the ETP-4 makes it a flexible solution for go-anywhere, body-worn applications, allowing remote video content capture without the need for additional transmission infrastructure. The ETV-5 3G/4G transmitter is optimized for vehicle-mounted video communications. Using premium video and audio compression technology and 3G/4G cellular transmission technology, it provides high-speed, video, audio and data transmission. Packed with the industry-standard 1-DIN, in-car format, the Vislink ETV-5 vehicle transmitter delivers on the need for live mobile video transmission from any location. The ETM-6 external RF unit delivers high-performance RF capability within an IP65-rated waterproof housing, making it perfect for optimal RF connectivity in all environmental conditions. The ETM-6 has a simplified design with combined data and power connectivity and is it ideal for roof-mounted installations. HEVC compression will be available on the ETP-4, ETV-5 and ETM-6 by the end of Q2.